Dozens of top footballers, including the England players Wayne Rooney and Gareth Barry, are avoiding millions of pounds in tax. The Premier League footballers are using complex tax avoidance schemes that legally allow them to pay as little as 2% tax on some earnings. Rooney used a device that enabled him to save nearly £600,000 over the past two years, and the tax liability of Barry, of Manchester City, is £135,000 less than if he had been subject to income tax at 40%. 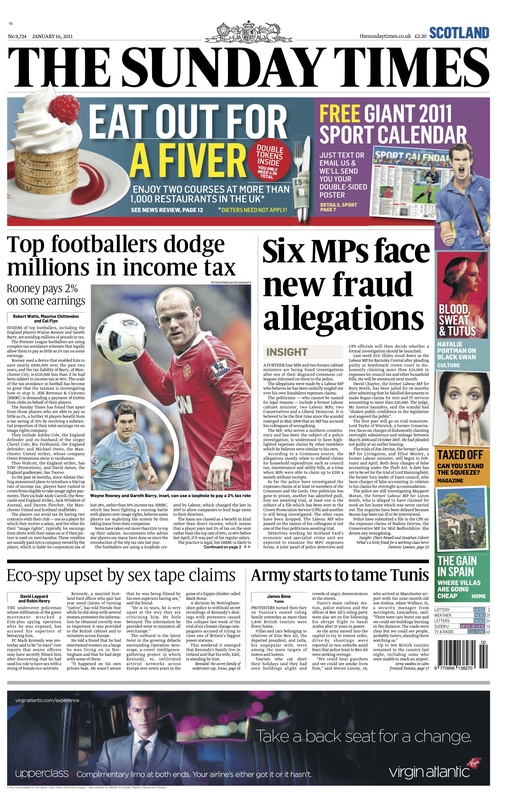 The scale of the tax avoidance in football has become so great that the taxman is investigating how to stop it. HM Revenue & Customs (HMRC) is demanding a payment of £100m from clubs on behalf of their players. The Sunday Times has found that apart from those players who are able to pay as little as 2%, a further 55 players benefit from a tax saving of 22% by receiving a substantial proportion of their total earnings via an image rights company. They include Ashley Cole, the England defender and ex-husband of the singer Cheryl Cole; Rio Ferdinand, the England defender; and Michael Owen, the Manchester United striker, whose company Owen Promotions owns 11 racehorses. Theo Walcott, the England striker, has TJW (Promotions), and David James, the England goalkeeper, has Toocoo. In the past 18 months, since Alistair Darling announced plans to introduce a 50p top rate of income tax, players have rushed to create firms eligible to take image rights payments. They include Andy Carroll, the Newcastle and England striker, Jack Wilshere of Arsenal, and Darren Fletcher, the Manchester United and Scotland midfielder. The players can avoid tax by having two contracts with their club — one as a player for which they receive a salary, and the other for their “image rights”, typically for earnings from shirts with their name on or if their picture is used on merchandise. These royalties are usually paid into a company owned by the player, which is liable for corporation tax of just 28%, rather than 50% income tax. HMRC, which has been fighting a running battle with players over image rights, believes some players are exploiting the system by then taking loans from their companies. Some have taken out more than £1m to top up their salaries. Accountants who advise star players say many have done so since the introduction of the 50p tax rate last year. The footballers are using a loophole created by Labour, which changed the law in 2007 to allow companies to lend large sums to their directors. The loans are classed as a benefit in kind rather than direct income, which means that a player pays just 2% of tax on the sum rather than the top rate of 50%, or 40% before last April, if it was part of his regular salary. The practice is legal, but HMRC is likely to challenge any player who does not have a scheme to pay back his loan. Companies House filings reveal that England players such as Rooney, Barry and Daniel Sturridge of Chelsea have taken directors’ loans from their private companies. Rooney, now reported to earn £200,000 a week, has borrowed £1.6m over the past two years from his company. Had he taken the loan as income he would have been liable for 40% income tax, paying £622,802. By using the device of a loan, he needs to pay only £25,511, a saving of £597,291 in tax. Barry borrowed £372,784 from his company last year. Had this money been treated as income, the player would have had to pay £134,178 more tax. Sturridge and his father Michael have borrowed £312,008 from a private company controlled by the player — saving £111,083 in tax. Players who have taken loans could choose to pay them back when the 50p rate is lowered, and then take it as a dividend. However, some advisers have told players they can “collapse” their companies at the end of their careers and end up avoiding the income tax charge altogether. Peter Fairchild, a partner at the accountants Begbies Traynor who advises many top sportsmen, said: “In tax terms taking a director’s loan from an image rights company is very, very efficient. HMRC has often challenged the amount of a player’s income attributed to image rights, but it lost a test case in 2000 after claiming that two Arsenal players, Dennis Bergkamp and David Platt, were trying to avoid tax by paying income from their image rights into offshore companies. The players successfully argued that the money was for their pension funds. Manchester United last year disclosed that it was embroiled in a dispute over £5.3m concerning image rights to its players. HMRC is negotiating a payment of £100m from the clubs to make good tax owing because they overstated the proportion of players’ income that should be attributed to their image rights. A spokesman for HMRC confirmed that the use of directors’ loans from players’ companies was also being looked at as part of their investigation. “HMRC are well aware of attempts to use image rights as well as other schemes to avoid the 50% rate of tax,” the spokesman said. A spokesman for Rooney said: “Everything Wayne’s companies do is legitimate and within the letter and spirit of the law.” Agents for Barry and Sturridge did not return calls. Julian Hedley, a partner at Saffery Champness who has advised sports stars for 20 years, said loans from image rights “come with a very serious health warning”. He added: “It’s possible the players and their agents will not have put a loan agreement in place and will not even be charging interest. There is added urgency. Uefa, which controls the lucrative Champions League and Europa League, has given clubs until next year to be transparent in their accounts under its financial fair play regulations.